This is a more adult version of the classic – more sophisticated and better for you than condensed Campbell’s, but just as quick to make. It also tastes phenomenal. I used home-canned tomato juice as the soup base, which guarantees very tomato-y flavor (Brandywines are my favorite for juicing). But this recipe will work with tomato juice from the grocery store, too! If possible, get a lower-salt variety, since the beans in the recipe are also salted. My roasted red peppers in jars at the grocery store, since most years they don’t grow well enough here for me to roast and preserve for the winter. I buy them already roasted because that’s cheaper than buying them fresh. Use whatever kind you like – marinated in water or in oil; jarred on their own or with accompaniments, such as garlic cloves. I ate it with grilled cheese, of course. The bread was courtesy of my friend DeKalb. He often picks up day-olds from a bakery near his house. It’s sourdough wheat with various seeds and tastes wonderful, and is nice to have when I’ve been to distracted to bake my own. 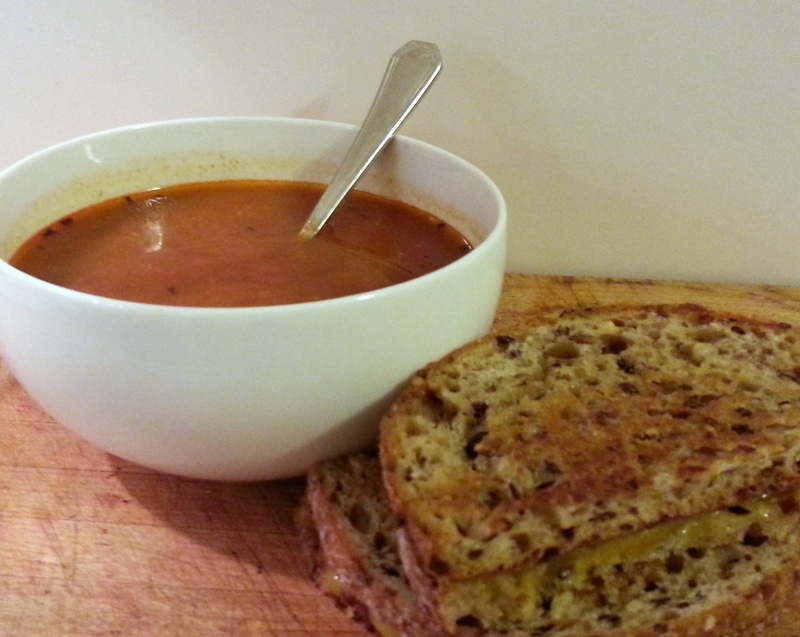 Grilled with sharp cheddar, it was perfect for dunking into the tomato soup. If you don’t eat cheese – or even if you do – avocado mashed on its own or with beans would make a great alternative filling for your grilled sandwich. 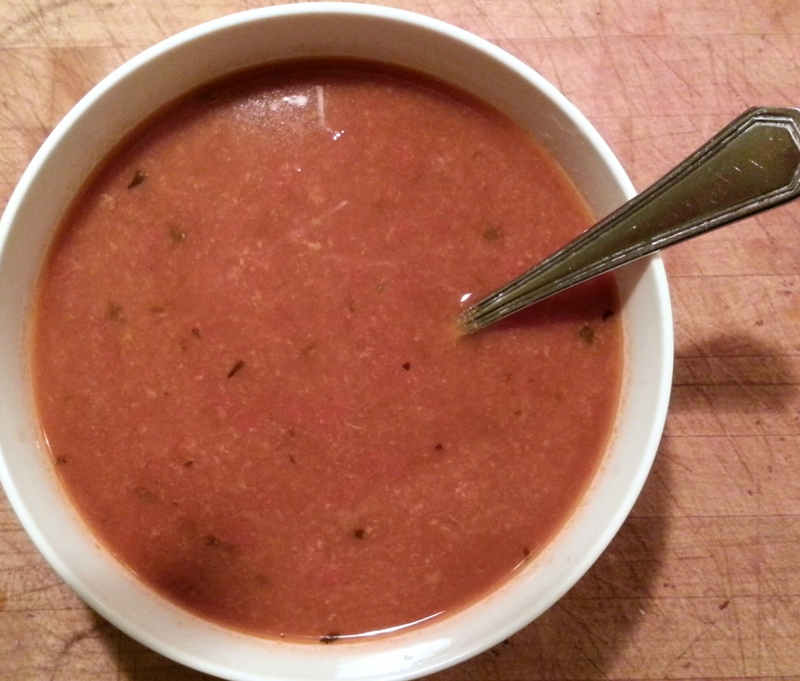 The dark flecks are pieces of basil floating toward the top of the soup. Put everything in a pot. Bring to a boil, then let simmer for a few minutes to let the flavors meld. Remove from heat and puree with an immersion blender. I puree just long enough to get the pepper broken up, as I like to have a little texture in my soup. Puree for longer if you want it smooth. Add salt if neither your tomato juice nor beans contained any. *Note: Do not add the milk at the beginning. Boiling it will cause it to curdle, and you’ll end up with little chunks of milk floating in your soup. It really was. I am on quite the simple dinners kick lately ... I wonder where it will take me next! I love the rich color of it.